Heat oven to 425°F. Grease large cookie sheet with 1 tablespoon of the oil. Unroll pizza crust dough onto cookie sheet; press into 16x13-inch rectangle. Bake 8 minutes. Meanwhile, in 12-inch nonstick skillet, cook sausage 5 to 7 minutes over medium-high heat or until sausage is no longer pink, stirring frequently. Transfer sausage to small bowl; set aside. Add remaining 1 tablespoon oil to skillet. Cook zucchini, onion, bell pepper and salt over medium heat, stirring frequently, until vegetables are crisp-tender, about 10 minutes. Add sausage to vegetable mixture; stir to combine. In medium bowl, beat eggs with wire whisk. Beat in Parmesan cheese and pepper. Drain vegetable-sausage mixture, if necessary. Pour egg mixture into skillet; stir to combine. Cook over medium heat 1 1/2 to 2 minutes or until eggs are partially set, stirring occasionally. 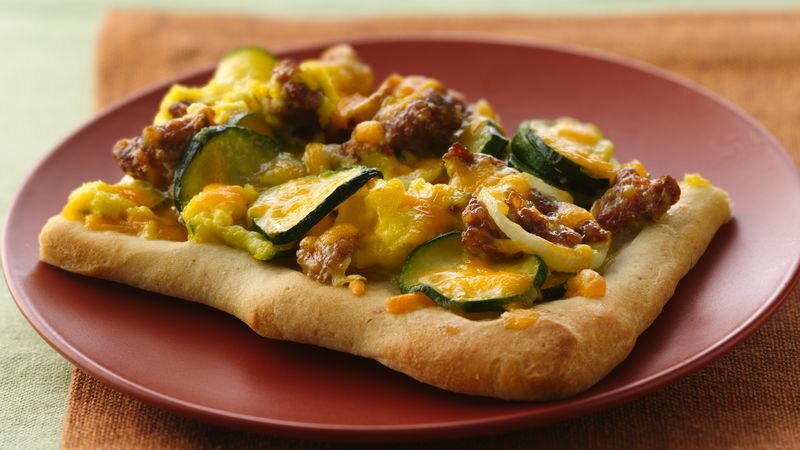 Spoon vegetable, egg and sausage mixture onto prebaked pizza crust to within 1/2 inch of edges. Top with Cheddar cheese. Bake 6 to 10 minutes or until egg is set, cheese is melted and crust is golden brown. Let stand 2 minutes before serving.